Imagine visiting the doctor for the common cold and being told to lose weight. Or, the gown you're asked to wear for an outpatient medical test is too small. Whether blatant or subtle, fat shaming by a health care provider is all too real for some patients. And it can result in a variety of negative psychological and behavioral health effects. "People [patients] will be asked, 'Are you following your diet?' or 'You're not following your diet, are you?'" says Joan Chrisler, PhD, a Connecticut College psychology professor who presented at the "Weapons of Mass Distraction — Confronting Sizeism" symposium at the American Psychological Association's 125th Annual Convention in August 2017 in Washington, DC. "Most people who are on a diet are not going to lose weight. Or, if they do lose weight, they're going to gain it back again." In agreement is Maureen McHugh, PhD, an Indiana University of Pennsylvania distinguished professor who also presented at the symposium. "Probably they [the patient] already tried and either couldn't lose weight or regained it," she says. Because studies indicate that a large percentage of individuals who engage in weight loss efforts cannot attain weight loss—while those who do attain weight loss cannot maintain it—a medical professional's prescribing weight loss or otherwise fat shaming merely triggers a patient's anxiety, depression, frustration, and sense of futility. The health care provider is doing no more than making the patient feel bad about herself or himself, McHugh stresses. "Doctors may not be saying, 'You're too fat or repulsive,' but 'You need to lose weight.' What they're saying is, 'You're unacceptable in your current body size.' That's not appropriate," McHugh says. "Making people feel anxious, depressed, shameful, or like a failure—none of these things are going to relate to being healthy." She adds that fat shaming at a health care facility exacerbates insecurities that the individual may be experiencing in other parts of her or his life. And, just like anyone else, health care professionals can fall prey to the stereotype that a heavy-weight individual isn't determined, committed, or disciplined enough to achieve weight loss, McHugh says. "They [health care professionals] haven't actually read the literature. Or they believe the mistaken literature that it is possible to lose weight, so they're telling them [patients] to engage in another failure behavior," McHugh says. "It triggers thoughts [in the patient] that 'I'm inadequate—not a good enough person.'" What's more, instructing a patient to diet is unethical, Chrisler says. "This is not new information that most diets fail; it's been known for decades," Chrisler says. "Shaming behavior is saying, 'Something is wrong with you.' Health care professionals shouldn't be doing that for scientific reasons as well as humanitarian ones." McHugh concurs, noting that eating is not an option but a life-sustaining necessity. "So when a medical professional tells a fat person to go on a severe diet, it's really ironic because they're telling them to engage in behavior that is the pathology for people with anorexia or bulimia," she says. McHugh recalls an occasion when she spoke to clinicians in psychology training about eliminating size bias. "Somebody said, 'Shouldn't you advise them [patients] about nutrition?' And I'm thinking, 'Really? You're not a nutritionist,'" she says, noting that it's unethical for a health care provider to work outside his or her own area of expertise. In addition, she points out, such advice would be based on the assumption that a heavy-weight individual is not eating nutritiously. "Medical professionals might make them [patients] feel guilty either for eating potato chips or a high-carbohydrate diet, but fat people don't necessarily eat terribly," McHugh stresses. "That's based on another fallacy." Physiology plays a role in body weight, Chrisler explains, adding that a slim individual shouldn't necessarily take credit for her or his body size. Once fat is gained, the body tends to preserve it to protect against famine or illness, Chrisler explains, noting that society would be better served by public health initiatives that discourage excess weight gain among youth. Rather than following rules about eating, individuals should aspire to intuitive eating—learning to eat when truly hungry and to ascertain what the body is craving, McHugh says. For example, a person is likely to overeat if he or she is craving protein but eats only carbohydrates. "On diets," she says, "you're working against your body's natural mechanisms." Chrisler surmises that, while some people might believe that a heavy-weight individual is accustomed or desensitized to repeated insensitivity from others, he or she can actually experience a shock reaction when treated insensitively by a health care practitioner. "When you're being shamed by a doctor or another type of professional who is supposed to have your best interests at heart and is supposed to be helping you, it's more shocking than being yelled at on the street or being teased in a classroom," Chrisler says. She further explains that respect and care are essential parts of any professional-client relationship—including that of health care provider and patient—and that the absence of those qualities can make a client feel less worthy of attention. "I've heard from heavy-weight women that, before a doctor will treat them for a broken toe or strep throat, they have to watch a film about bariatric surgery," Chrisler says. Fat shaming is not always quite so obvious. It can take the form of microaggression, or, as Chrisler explains it, "an action that might be ambiguous but communicates subtly that the target of the microaggression is marginalized, unwelcome, or disliked." Microaggression can range from waiting room chairs that are too small for large bodies to a physician who avoids touching a large patient. An undersized examination gown can lead a patient to think, "If they wanted me here, they would have my size," Chrisler says. "There are reports of doctors or nurses kind of 'tsk, tsking' as they write the person's weight in the chart," Chrisler continues. "Any one microaggression is not a big deal, but if it happens a lot and it's all in the same vein—'How did he look at me? What expression was on his face when he wrote down my weight? '—it all adds up and becomes a big ball of stress." Regardless of the way in which fat shaming occurs, it can result in a patient's missing important, legitimate health care advice that addresses the real reason for the medical visit. "When people are being shamed, they feel shocked or anxious, and it's hard for them to hear what they're being told," Chrisler says. "Whether they're being given instructions on how to take care of themselves or take medication, they don't hear it because they're in a state of shock, in a way." The patient may engage in avoidance behavior so as not to repeat the negative experience—thereby putting herself or himself at greater health care risk by refusing to seek further treatment. "The shaming colors the whole experience," Chrisler says, "and makes them [the patient] less likely to return." Social workers can combat sizeism by ensuring that the waiting area and offices in which they provide services are size-friendly and, for example, feature large chairs. Magazines and wall décor should represent diversity, including plus-size models. All of these elements, Chrisler says, are "subtle communication that 'Everyone's welcome here.'" McHugh adds, "Don't have women's magazines promoting weight-loss in the waiting room. Don't have pictures on the wall of thin, beautiful models." By reading the literature, social workers would discover that many medical views about weight loss are incorrect. Rather than prescribing weight loss training, which is punitive, McHugh says, a social worker should encourage a client to find some type of enjoyable, sustainable physical movement. She recommends that social workers adopt ideas from the Health at Every Size movement. Perhaps among the most important steps a social worker can take is to examine his or her own attitudes regarding size. He or she should not automatically conclude that weight is a client's issue. "If they [clients] don't ask for help with weight loss," Chrisler says, "then that's not the problem." If a client does identify weight as an issue, a social worker can refer her or him to a book, class, or nutritionist. However, McHugh recommends caution, citing her own experience in a nutrition class. "The instructor was fat phobic," McHugh recalls. "She said you couldn't have fats in your diet. That information was already outdated. You should have some healthy fats in your diet." 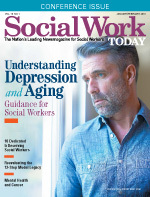 McHugh reminds social workers to simply treat clients as people—not as "fat people." "Especially in social work, the idea is to try to improve their mental health and mental state and get them to a place of self-acceptance," she says. "You can't do that while you're shaming them." — Nadine M. Hasenecz, MSW, LSW, is a freelance writer who lives in Bethlehem, PA.